A leaked RIAA report shows that most music piracy do not occur online, but that 65% of all music files have not been legally paid for. The statistics come from analysis firm NPD's Digital Music Study, which was used to highlight the successes the RIAA has had in fighting music piracy, with the closure of LimeWire as a milestone in the fight against illegal downloads. But other some vague statements from both NPD and the RIAA regarding the changing habits of music downloaders, the precise figures had so far been kept confidential. Until now. 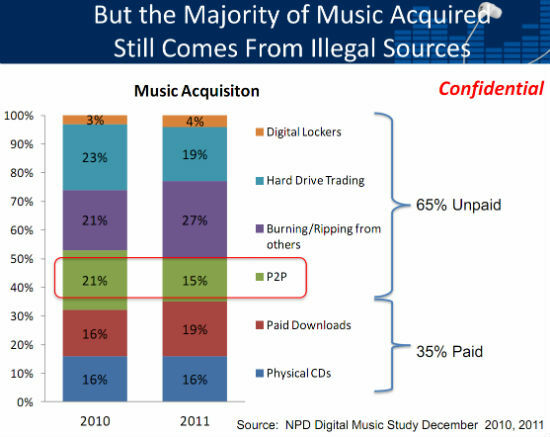 While the statistics do show that P2P piracy had been reduced, from being 21% of the source of all music files, to only 15% from 2010 to 2011, and with paid music's share increasing from 32% to 35%, what the RIAA failed to mention was that more than 70% of illegally obtained music files were obtained away from the Internet, from hard-disk trading and burning/ripping from others that have purchased CDs and tracks. So far from being the source of most pirated music, the Internet appears to only play a small role in the music piracy game, surprising considering the RIAA's hardline approach towards Internet pirates. And despite the multi-national law enforcement effort to take down Megaupload, music downloaded from digital locker piracy only accounted for 6% of all illegal music downloads. And perhaps most frustrating for the RIAA was 6% rise in burning/ripping of music from friends and family, from 2010 to 2011, almost single handedly replacing the decline in P2P downloads. It seems even with the closure of major online outlets for pirated music, the war against piracy is still far from being won, and that the harder problem of tackling offline music trading still waits a solution.